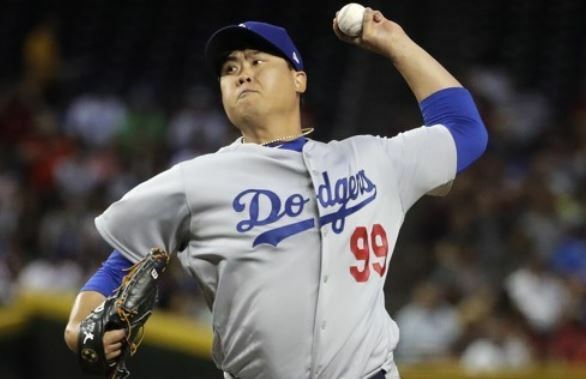 The Los Angeles Dodgers' South Korean starter Ryu Hyun-jin has picked up his first win of the season with six shutout innings against the Oakland Athletics. The left-hander held the Athletics to just one hit at Dodger Stadium in Los Angeles on Tuesday (local time), while striking out eight and walking one. He was lifted for a pinch hitter in the bottom of the sixth inning with the Dodgers leading 4-0, and the Dodgers went on to win by the same score. This was Ryu's second start of the season, and his first since April 2 against the Diamondbacks. In his season debut, Ryu lasted just 3 2/3 innings while allowing three earned runs on five hits and five walks. Ryu had never faced the A's before Tuesday. Ryu looked sharp from the get-go and struck out three consecutive batters across the first and the second innings. In the top third, Ryu picked up two more strikeouts, both of the swinging variety. Ryu fanned A's slugger Khris Davis to end the fourth inning on a cutter. The A's broke Ryu's bid for a no-hitter with two outs in the fifth with Stephen Piscotty's single. But the lefty regrouped to get Jake Smolinski to pop out to second for the final out of the inning. And Ryu struck out Trayce Thompson and Marcus Semien to start the sixth, raising his K totals to eight for the day. That's a single-game high for Ryu since April 30 last year, when he struck out nine Philadelphia Phillies. After this encouraging start, Ryu's ERA dropped from 7.36 to 2.79. This was Ryu's second career start in which he allowed just one hit. The first came Aug. 6 last year against the New York Mets. Ryu threw 90 pitches, 60 of them for strikes. He had an excellent command with his cutter, and five of his eight strikeouts came on that pitch. Ryu also mixed in his curve and changeups with great effect, keeping the A's hitters off balance all game. Ryu began the year as the Dodgers' fifth starter behind Clayton Kershaw, Rich Hill, Alex Wood and Kenta Maeda. Ryu's hold on the spot appeared more tenuous after his shaky outing against the Diamondbacks, as the Dodgers' top pitching prospect, Walker Buehler, is biding his time in Triple-A.